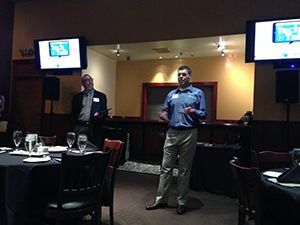 The inaugural Tech Talk AV event for technology managers at InfoComm 2014 opened Tuesday evening to a highly engaged group of attendees that kept the conversation going well into the night. Control Concepts and BMA Software Solutions, both independent control systems programming providers, partnered to launch this new series of in-person and online network and resources. The keynote presentation from Steve Greenblatt of Control Concepts and Marc LaVecchia of BMA covered how to plan a system, boiling ideas down to a scope of work, system standardization, best practices for implementation, troubleshooting, and next steps. The two control experts assembled a list of the top 10 tech manager challenges, which they ran through in descending order. Buying a product based on a sales pitch was the first one discussed. LaVecchia urged tech managers to fight this urge because “pioneers get the arrows in the back,” he mused. Greenblatt added that they should take that product and work with it well before implementing; “put it in a pilot room,” he advised. Designing systems before deciding what to do with them was up next, followed by designing specs while leaving out functionality. “Plan the work, and work the plan,” LaVecchia said. Tech managers should start by defining needs, the users, and then the system. At this point right about the second slide in the presentation, tech managers started to jump in to ask questions and share their own specific experiences. There was no shortage of engaging contributions from the attendees. Some of the other challenges on the list included trying to reinvent the wheel, changing what works for the sake of change, updating firmware just because, not keeping the latest as builts, not keeping the latest code revisions, not maintaining records of modifications, and failing to identify what makes your job easier.